Schematic diagram showing distribution of reflected radiation from a diffuse reflector. This schematic diagram depicts the behavior of a perfectly diffuse, or Lambertian, surface. 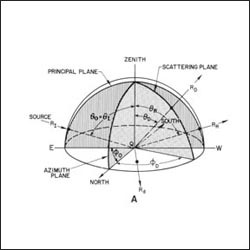 This diagram appears in the The Landsat Tutorial Workbook: Basics of Satellite Remote Sensing written by Dr. Nicholas M. Short and published by the NASA Scientific and Technical Information Branch in 1982. 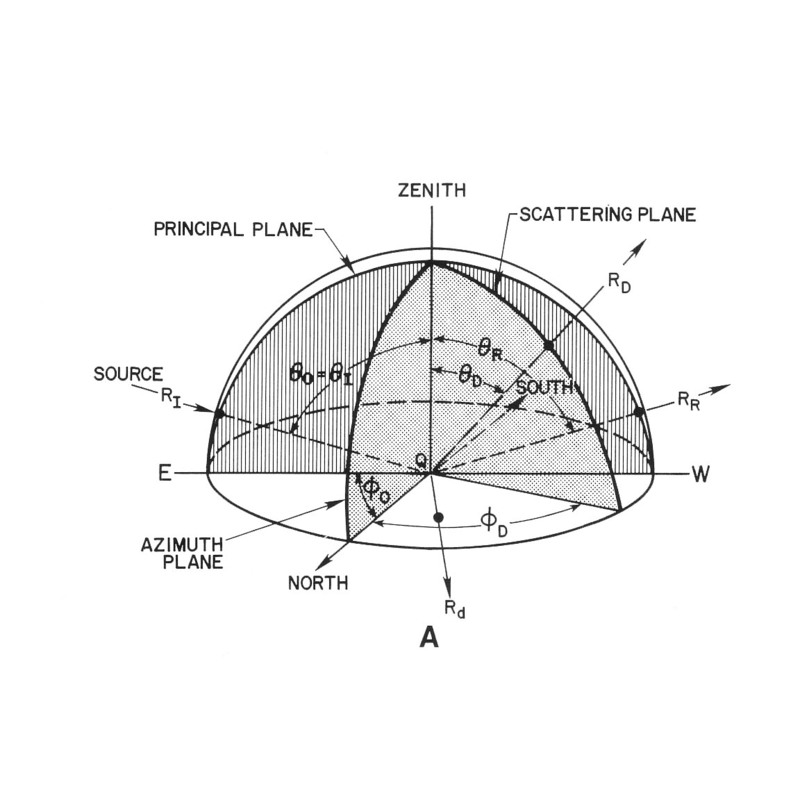 Dr. Short writes, “Consider a bundle of rays (making up the radiation flux) from a single distant source position at an incident angle θI (relative to the zenith direction) and an azimuth angle φ0 (relative to north). Imagine the (arbitrarily) horizontal plane of a target being irradiated to be enclosed in a hemisphere (this simplifies some calculations because it allows polar coordinates to be used [which we will ignore here]). For the wavelength conditions we set, the surface is considered rough or diffuse and has irregularities where the surface departs from horizontal, at varying slopes. A given ray RI located in the principal plane now strikes the surface at a point Q1. It will be reflected according to the position of the minute surface at Q depending on its slope. If that surface is horizontal (slope = 0°), the ray moves away along path RR in the principal plane as though this geometry is specular. But if the point surface QS is non-horizontal, i.e., has varying slopes defining the shape of the irregularity, the ray (mathematically treatable as a vector) will now move out along some direction RDthrough its scattering plane whose position is defined by θD and φD. At other points (Qn) on the surface, the direction of the outgoing R will differ according to the orientation of the slope at the immediate irregularity. Thus, a large number of incoming rays meeting the surface at other irregularities (most probably with randomly oriented slopes) will be redirected (diverge) in all possible directions extending through the hemisphere of reference.